Odds on used to be one of the most prominent developers, providing software for casinos like English Harbour, Caribbean Gold and Millionaire Casino. In 2006 the group of named above casinos ceased their operations. The software was renamed to Vegas Technology, and later to WGS Technology. Find more infornmation about game of baccarat by WGS. 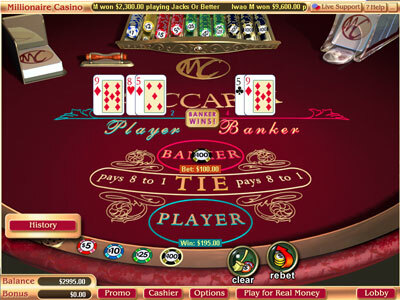 At Online Casinos powered by OddsOn Gaming the game is played at Mini Baccarat table. 8 Decks, cards are dealt face up. Very fast speed of the game, History of bets.